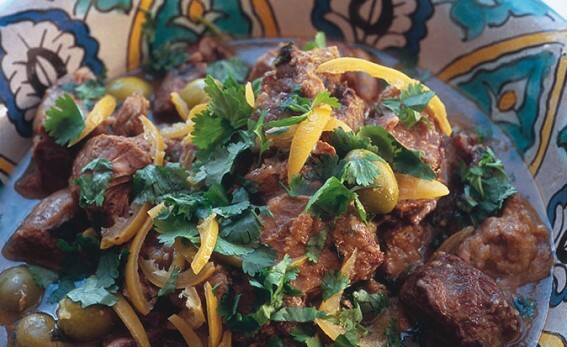 Not authentically Moroccan, because Moroccan cooks wouldn’t brown the meat, but I think it produces a better flavour. A company called Belazu makes preserved lemons but the lemons are very small (a Moroccan variety we don’t get here), so if you’re using homemade preserved lemons you’ll need just one of them. Heat the olive oil and the butter in a heavy-bottomed pan and brown the lamb on all sides. Add the onions, stir them round in the juices and cook for a minute, then add the garlic, spices and seasoning (easy on the salt as the preserved lemons make the dish salty later on) and cook for another minute. Add the stock or water, bring to the boil, then reduce to a simmer. Put the lid on the pan and reduce the heat to very low. Cook for 1 hour, stirring from time to time. Discard the preserved lemon flesh and cut the rind into shreds. Take the lid off the pan and add the olives and most of the lemon. Cook for another 15 minutes, during which time the juices will reduce. Check the lamb: it should be tender. Stir in most of the herbs, sprinkle with the remaining lemon and herbs and serve. Heat olive oil and butter and brown the lamb as above. Add the onions as above, then add 4 garlic cloves, finely chopped, 3 tsp ground ginger, 2 tsp ground cinnamon and seasoning and cook for another minute. Throw in 225g (8oz) dried apricots and 50g (1 ½oz) dried sour berries (barberries, cranberries or sour cherries). Add 700ml (1 ½pints) lamb or chicken stock or water and a good pinch of saffron, if you have it. Cook as above for 1 hour, then remove the lid and cook for 15 minutes. The lamb should be tender. Stir in 2 tbsp honey, a good squeeze of lemon juice and 2 tsp orange flower water, if you have it. Add 2 tbsp roughly chopped flat leaf parsley, mint or coriander and check for seasoning and flavour; you may want more honey. Sprinkle with 2 tbsp chopped pistachios or almonds before serving.